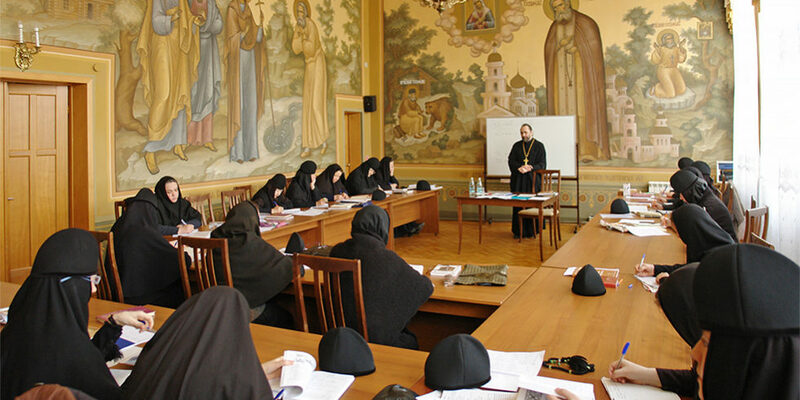 Beginning from 2008, sisters of the Seraphim-Diveyevo Monastery were able to enroll in the two-year theological courses that included learning traditions of the Orthodox faith, as well as major dogmas and ethics of Christianity. The studies are conducted by the instructors from the Nizhny Novgorod Seminary. Since the beginning of this program, five cohorts of 20 to 25 sisters in each have completed the two-year studies. Since the beginning of 2019, two additional subjects were offered to those sisters of the monastery who have already completed a two-year program: Principles of Social Policies of the Russian Orthodox Church and Church Slavonic. The third and final cohort is currently enrolled in classes. Protopresbyter Sergiy (Lariushkin) conducts studies of Church Slavonic. “Aim of this course,” said Fr. Sergiy, “is to define certain peculiarities of this language, touch upon its richness, and explain differences between this and Russian languages in such aspects as graphic, phonetic, morphological, syntax, and lexical. This language is double-natured because its words and texts carry not only their direct meaning but spiritual value as well.